We celebrated the hubby’s birthday this week. It was nice spending time together, shopping, having coffee, and rounding it off with a yummy sashimi dinner. Especially after the busy period of moving and settling into our new home. We’ve gotten into a habit of not buying each other gifts but instead would let the other choose their own gifts. I guess you could call it the lazy way out but I’ve realised that he also likes the process of browsing and choosing something. I thanked him for being a wonderful listener. I thanked him for tolerating my nonsense. For being understanding (and not judging) even when I feel upset or down. 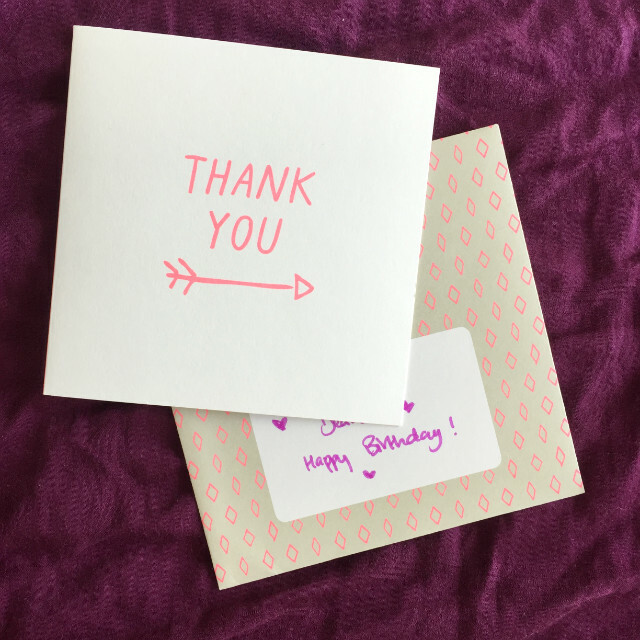 The list went on, and I found it was quite easy to fill the entire card with ‘thank yous’! Almost like turning on a gratitude engine…it just kept flowing. I realise that after writing down the things that he does that makes me feel valued and loved, I started to see him even more positively. A sense of gratitude welled up, and I also thanked God for him. As fallible and as flawed as he may be (and I, too) I saw that I had a lot to be grateful for. Gratitude changed my perspective. I think it also helped him to recognise the things he does that really mean a lot to me. Simple things like listening to me when I’m feeling down or lost. Simple things like laughing with me, or making me see the funny side of a situation. Small things like caring for the kids, and playing with them. Although I wrote the card for him, I actually felt quite good after writing it, as if expressing it somehow made me pay more attention to the good, and feel happy as a result. And maybe also sneak little surprises / notes into his work-bag from time to time. Never underestimate the power of these humble words “thank you”. They can enhance your marriage relationship, and even counter existing negativity…Most of all, I think it keeps our hearts soft towards each other, and trains us to focus on the good aspects and encourages the other to do the same. What’s your favourite way of expressing thanks to your partner? I had a good day last week, one of those where you feel like patting yourself on the back at the end of the day. One of those where things fell into place, the kids behaved okay, and you feel like you’re in one piece. One big happy piece. I breathed. I played. I observed. I smiled. I ate. I played a bit more. I socialised. I comforted. I chided. I took a walk downstairs with Vera and JJ while Josh was having a nap, got the groceries, stopped for a cuppa, broke up a fight. All small things. But I was reminded to not look down on the small. The small things add up. Small thoughts form a a mindset. Small habits, a life. Small acts of kindness can mean so much to a person who’s feeling down and lost. Small words of encouragement could even save a soul. But the next day came and it turned out awry. One kid was particularly cranky. My plans were disrupted as I found out (only upon arriving at the door) that the store I wanted to get some groceries from was still closed for CNY. Immediately after, I missed the bus and was irked to find that it would take another 20 minutes for the next one to arrive. The small things added up too, and I was a total grouch master upon arriving home. By dinner time, I was already hiding in my room, away from the kids and the noise and the scuffles. Away from the messy business of parenting. It was then I realised that there is no such thing as a perfect day. We often cannot control how our days unfold. What we CAN control is our responses to the events, and our responses to the people around us. By choosing gratitude, we redeem the day, warts and all, and turn it into something more bearable. A grateful heart makes it easier to see the things that do go as planned, rather than ruminate over the ones that don’t. A grateful heart helps us let go of the stress and anger that have crept in during the day. A grateful heart makes it easier to connect with, rather than push away, the people you love. A grateful heart makes it easier to navigate the unknowns of life. How exactly do we cultivate a grateful heart? Here are 9 good ways. Starting from today, take time to pause, and count your blessings. Take time to hug and do small things with great love. Notice when you’re ruminating on negative thoughts. Catch them and think about the positive side for a change. Make a gratitude list. Practice good emotional hygiene. Notice when you’ve done well, give yourself a pat on the back for it. And in areas where you haven’t, don’t beat yourself over it. Being kind to yourself is a form of self-care too. Breathe in those small and simple joys. Breathe in hope and delight. 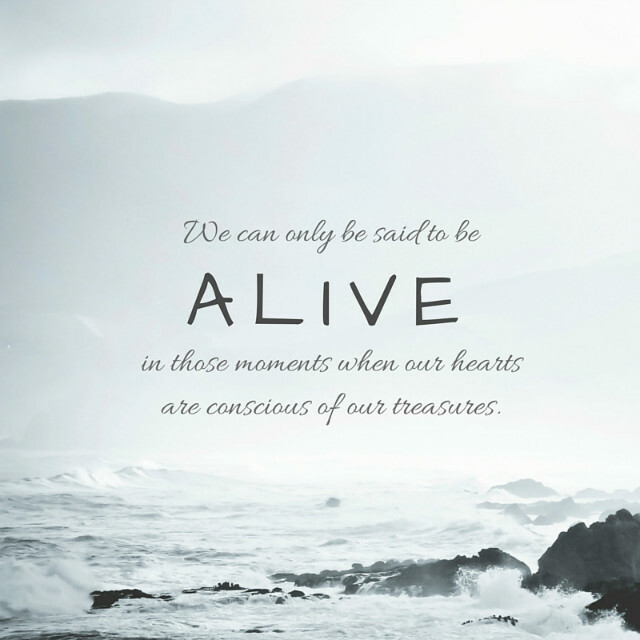 Let our hearts be conscious of our treasures. This photo was taken when Vera was about 2. We were taking a walk in the park with my mum. I lagged a little behind to take this shot, but I was still able to catch her animated conversation with granny. I remember thinking how blessed my kids are to have not just one loving grandma, but THREE. Yes, that includes their paternal grandma, and my god-mother. All three are actively involved in their lives. One practically lives in our house. Another comes faithfully three times a week, and helps to pick Vera home from school. Another visits on the weekends. They are the reasons why I can go to work in peace, knowing that the kids are in good hands. Naturally, there are disagreements about how to train and teach the kids. I’m always the one who likes to control the kids’ schedules, nap times, feeding habits, and many a times this led to feelings of frustration and negativity (particularly when Vera was still young) whenever me and my mum couldn’t see eye to eye, or when I couldn’t get her to cooperate in some areas. But I’ve come to see that grandies and parents play different roles, and as long as both sides can stand on the same side on most things and for the crucial pre-school years, I think the children stand to benefit. I also learnt to deal with those negative emotions (actually, still learning). Learning to let go is very much part and parcel of the parenting process. This time round with JJ, I think I’m handling it slightly better. And I’m picking my battles very selectively; major in the majors, right? As long as the kids are loved and cared for, follow a reasonable routine, and are eating healthy, encouraged to be independent, I’m content. I really want to say a great big thank you to all of you for your sacrifice and unconditional love for the children. I really don’t think I could have survived this whole parenting thing unscathed without you, and that includes the grandpas too. I know I don’t say it enough (or is it at all? ), but I love you all very very much. And I know daddy, Vera and JJ do too.